Obudu is a local government area and town in Cross River State, Nigeria. The area features a tourist resort, Obudu Cattle Ranch, which hosts an annual mountain running competition called the Obudu Ranch International Mountain Race. The town of Obudu is downstream from the Obudu Dam, which has caused acute scarcity of drinking water in the dry season. The town is approximately 17 kilometers away from Bebi Airport and is a 6-hour drive from Calabar, the capital of Cross River. The Obudu Local Government Area is bordered to the north by Vandeikya of Benue State, to the east by the commune of Akwaya in the Republic of Cameroon, and to the south and west by the Local Government Areas of Boki and Bekwarra. The local government headquarters is located in Bette clan, with the Bette-Bendi occupying the central position, and the Ukpe-Alege occupying the southern reach of the geo-cultural spread. The Obanlikwu, Utanga-Becheve, and Utugwang now form an independent Obanlikwu Local Government Area. The Obudu geo-cultural area is home to six clans: Bette, Obanlikwu, Bendi, Utuwang, Ukpe-Alege, and Utanga-Becheve, all of which thrived as independent villages with a strong culture of kinship. The origins of the Obudu people are unknown, although it is likely they migrated from somewhere to the east and reached the location they inhabited by the 18th century. The most popular tradition of migration, the Ulanga Legend, points to Ulanga, a mountain peak in the present day village of Amandakureke, in Utanga-Becheve clan as a secondary, or perhaps, tertiary dispersal center. There is a relative consensus in traditions across families that they were displaced at Ulanga by the invasion of a group referred to as Igenyi. This was described as a light-skinned people with soft bunching hair, clad in long-flowing gowns, armed with spears, mounted on horses, and with a large following of black servants. Extant literature suggests that these could have been Fulani, the Chamba, or Portuguese slave raiders, all three of whose imperialist expeditions in sub-Sahara are recorded to have peaked in the 18th and early 19th century. Another narrative suggests that progenitors of Obudu arrived at a place remembered as Onikal in the Cameroon country, before proceeding to Ulanga, from where the Igenyi dispersed them. Traditional accounts of the Bendi clan report they stayed briefly at Ukwel Unokel (translated as Mountain Unokel), before proceeding to Ulanga, the point of dispersal. It is likely that both Onikal and Ukwel Unokel allude to the same location. Other recollections suggest a shared origin between them, and their Bekwarra neighbors, whom they regard as historical "brothers". This possibility is reinforced by several cultural commonalities, including mutually intelligible dialects. In the light of the foregoing, if as believed, the Bekwarra had a powerful connection with the ancient Kwararaffa Empire, it is probable that the displacement referred to in Obudu traditions of migration correlates with the disintegration of Kwararaffa in the 18th century and spreading of its population. What appears to be a disparity in these recollections could be easily reconciled to derive plausible primary and secondary points of dispersal. At any rate, the mild variation in mutually intelligible dialects of its clans suggests splinter group movement, separate migratory experiences, and marginal variance in time of arrival. What, however, seems incontrovertible is that the Obudu clans had taken ownership of the area they inhabited by the 18th century, having emigrated from an easterly Bantu homeland. With the advent of British colonialism, the six Obudu clans were formally integrated into the then Ogoja province of the Eastern Region of Nigeria. After Nigeria's independence in 1960 and the local government review commission in 1976, Obudu became an autonomous local government council. 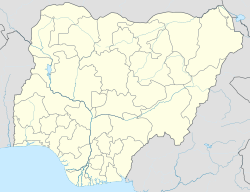 It has since remained one of the eighteen local government areas of Cross River State. Cross River recruited foreign qualified teachers for Model School, in Obudu Local Government Area. ^ Etiosa Uyigue (March 2006). "DAMS ARE UNRENEWABLE A Discussion Paper" (PDF). Community Research and Development Centre. Retrieved 2010-05-21. ^ "THINGS YOU DIDN'T KNOW ABOUT OBUDU CATTLE RANCH". Information NG. Information NG. Retrieved 18 May 2018. ^ AFR Stoddart, “Intelligence Report on Bette-Bendi Clan” (Obudu District, Ogo Prof CSE 1/85/4674. File No. Ed 8850A NAE) 7. ^ Anthony Ikpe Ugbe, “Obudu Resistance to Colonial Rule – 1930” (BA thesis, University of Calabar, 1986). ^ a b c UJ Ugi, "Warfare in Pre-Colonial Betteland" (Academic Seminar, Nigerian Defence Academy Kaduna, 2017). ^ "Bekwarra-Gakem: Nigeria Civil War First Bullet - Politics - Nigeria". www.nairaland.com. Retrieved 2017-06-23. ^ P.A. Talbot, The Peoples of Southern Nigeria: A Study of their History, Ethnology and Language with an Abstract of the 1921 Census Vol.IV, (London: Cas, 1969) 88-89. ^ "'Cross River to employ foreign teachers for Obudu Model School' - The Nation Nigeria". The Nation Nigeria. 2017-11-02. Retrieved 2017-11-21. This page was last edited on 29 May 2018, at 02:49 (UTC).